December can be a tricky time of the year. Despite all the festivity associated with Christmas there are many people who get anxious and even depressed this time of the year. Some say it’s the commercialization of the feast that overwhelms people with unwanted expectations and pressures. Some say it’s sad or trying memories of past experiences that surface. Whatever the cause may be, there are many among us who get overwhelmed this time of the year. At Christmas we celebrate the light that comes to dispel the darkness. In a real sense we celebrate that all the time. Traditionally the Third Sunday of Advent is referred to as “Gaudete Sunday.” “Gaudete” is the Latin word for “rejoice.” The title comes from the opening antiphon for the liturgy: “Rejoice in the Lord always, I say it again rejoice!” (cf. Phillipians 4:4) So we might ask: what is the reason for rejoicing? John the Baptist longed for the fulfillment of Isaiah’s prophecy. He came to prepare the way of the Lord. He baptized Jesus in the Jordan at the inauguration of his public ministry. Now, some time later, John has been arrested and imprisoned. Hearing the works of Jesus prompts him to send the question: “Are you ‘He who is to come,’ or should we look for another?” Jesus replies with this answer: “Go and tell John what you hear and see: the blind regain their sight, the lame walk, lepers are cleansed, the deaf hear, the dead are raised, and the poor have the good news proclaimed to them. And blessed is the one who takes no offense at me.” Jesus is the fulfillment of Isaiah’s prophecy of salvation. “Being born in the kingdom of heaven” requires faith in Jesus. Following Jesus and his Way leads to salvation. faith in Christ Jesus. Through faith we can see that the “coming of the Lord is near at hand.” One particular way of exercising patience, the passage points out, is by not complaining about each other in the communion of faith. While the pressures and expectations of the season can be overwhelming at times, keeping our focus on Jesus will help the joy of season to be real and deep. During our observance of Advent where we long for the Lord’s coming and we prepare for the celebration of Christmas we also remember Jesus’ abiding presence among us. Jesus is with us now as he promised to abide with us through his Spirit. He continues to come into our hearts, so long as they are open to him. He brings with him the same healing presence, the same saving grace, that was active in the public ministry. He continues to strengthen us and fill us with hope. He continues to lift us up in His love. He continues to be the light that shines in the darkness (cf. John 1:5). Msgr. 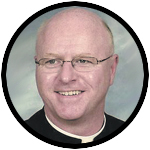 Joseph Prior is pastor of St. John the Evangelist Parish, Morrisville, and a former professor of Sacred Scripture and rector of St. Charles Borromeo Seminary. NEXT: Receiving the good news: Are we listening servants? Thank you, Msgr. for reminding us of what Christmas is about, not shopping and partying.